Super One Foods & Vitamins that Offer Many Anti Aging Viable Herbal Solutions. Best and Hottest Alternative Health Care that Contains Best Foods High in Antioxidant & Best Herbs that Boost Immune System. AbsoGreens is one of the best super one foods that offer many viable herbal solutions for aging and illness. It's the hottest alternative health care that provides the best foods high in antioxidant benefits and the best herbs that boost the immune system. It helps to fend off free radicals that caused aging, cancer, diseases, ailments, sickness, and against toxins from environmental pollution. This extraordinary and top super foods for health provides the recommended green foods, cruciferous vegetables, high antioxidant herbs, fruit, and tea. Researches have shown that some these valuable nutrients may have the benefits to be one of the potential natural cancer cures. The only product that combines high antioxidant herbs & anti aging vitamins. Do not waste your money on any other immune system supplement or immune system booster with minimal effectiveness. AbsoGreens with high antioxidant benefits (ORAC values) from Green Vegetables, Berry Fruit & Herbs is guaranteed to provide the best result or you get your money back! It's one of the best alternative health care that may help boost & strengthen your immune system. 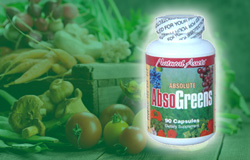 AbsoGreens, a beneficial supplement for auto immune diseases, is formulated with the purest and most potent ingredients. The product contains both eastern and western medicinal ingredients and is manufactured under FDA registered and approved facilities in the United States. Our formula offers top quality standardized extracts or concentrated extracts of healthy vegetables, high antioxidant fruits and herbs to ensure that consumers receive consistent and potent benefits from the herbs' active compounds, while retaining all the tradition whole-part characteristics from other complementary herbs. Spinach is loaded with iron and folate that not only prevents neural-tube defects in babies but also lowers blood levels of homocysteine, an amino acid that irritates blood vessels and is linked to heart disease. Spinach, with an ORAC value of 909, contains two phytochemicals lutein and zeaxanthin that seem to ward off macular degeneration, a leading cause of blindness. Broccoli is a potential natural cancer cure that contains rich source of beta-carotene, fiber and vitamin C. It contains a fistful of phytochemicals including sulforaphane and indole-3-carbinol that may detoxify cancer-causing substances before they have a chance to cause harm. A number of studies have linked regular consumption of cruciferous vegetables like broccoli to a reduced risk of breast, colon and stomach cancer. Broccoli has an ORAC value of 890 and could be one of the best natural cancer remedies. Barley Grass is unusually rich in chlorophyll (the green pigment that gives plants their colors). Barley Grass contains high concentrations of several vitamins, including vitamins A, B complex (including B12 and folic acid), C and E. Preliminary researches suggest that barley grass may help boost energy, fight cancer (Rutger Univervisty in New Brunswick, NJ), stimulate tissue repair, prevent coronary artery disease (studies in recent discovered antioxidant flavonoid 2"-o-glycosylisovitexin), increase anti-inflammatory properties (1998 Japanese Study in Alimentary Pharmacological Therapy). Order your AbsoGREENS Without Risk Today! Blueberries, a strong immune system booster, that contain more antioxidants (Oxygen Radical Absorbing Capacity - ORAC) and anti-angiogenic than any other antioxidant fruit or vegetables. Blueberries contain health-promoting compounds in anthocyanins, a bio-active phytochemicals that belongs to the flavonoid family. Besides combating the free-radical damage linked to heart disease and cancer, anthocyanins may boost brain power at least in rats' studies and one of the potent natural cancer cures. Blueberry antioxidant seems to fight off urinary-tract infections by preventing E. coli bacteria from adhering to the bladder wall. It's a best antioxidant fruit with an ORAC value of 2400 that may help boosting immune system. Bilberry supplements protect the retina and its blood supply, preventing and improving vision disorders, such as macular degeneration. Bilberry's anthocyanins may improve eyesight in a 1964 French Study. For several hours after supplementations, the patients' eyesight improved significantly, although the effect wore off within 24 hours. Bilberry, traditionally used for ulcers, may increase the production of stomach mucus and protect the stomach from injury. In an Italian study, 10 men took anthocyanins for 10 days. This increase their gastric juice secretion and mucus, while stomach acid production remained constant. Elderberry has an ORAC value of 240 and been researched as an immune system supplement and flu fighter in Israel. In the mid 1980's, an Israeli Doctor named Mumcuoglo discovered that Elderberry extract's active ingredients disarm the "spikes" on the flu virus which normally enable it to penetrate healthy cells, permitting the spread of the diseases. Follow-up blood tests showed a higher level of influenza antibodies, which would suggest that this herbal extract actually may help boosting immune system function. Cranberries are naturally rich in phenols and antioxidant compounds proanthocyanidins, which help to prevent disease-causing organisms from causing infection. In 1990s, the New England Journal of Medicine identified a component as proanthocyanidins in cranberries and blueberries that prevented the adhesion of certain E. Coli bacteria in the gut and to fight urinary tract infections. Flax Seed, one of the best high antioxidant herbs, contains a mix of beneficial nutrients including fair amounts of fiber and omega 3 antioxidant fatty acids. It also rich in lignans that are considered as one of the emerging new health ingredients. Lignans are phytoestrogens or naturally occurring plant estrogen. Flax Seed's lignans are also exhibiting strongest antioxidant activities. Researches suggest that Flax Seed lignans maybe provide the following potential benefits - Prostate health, Bone health, Breast health & menopause reduction, Heart health, Colon health, Hair Loss, and Acne. Garlic, best known as a potent immune system supplement, contains sulfur-based compounds known as allyl sulfides and other phytochemicals that may protect the heart. Studies show that garlic's sulfides can reduce cholesterol and may make the blood less sticky. Scientists are fairly confident that garlic also has antibacterial and antifungal powers. Cordycepts, one of the better herbs that boost immune system, is a mushroom harvested from the high mountain of Tibet. Cordyceps is considered as a longevity, endurance, rejuvenating and invigorating herb. Cordicept has many high antioxidant benefits and achieved popular when an Olympic Chinese women's team unveiled this mysterious mushroom as one of its training supplements to boost energy and enhance endurance. Green Tea, an antioxidant herb, is loaded with polyphenols, a class of phytochemicals with 100 times the antioxidant punch of vitamin C. Laboratory experiments suggest that one group of polyphenols in green tea called catechins may inhibit the growth of new blood vessels, which some scientists think may help prevent cancer by depriving early tumors of nourishment. Green Tea is one of the best studied natural cancer remedies. Population studies in China link drinking green tea daily with a lowered risk of stomach, esophageal and liver cancers. Studies from Japan show that consuming 10 cups of green tea a day may reduce the risk of heart disease. Lycopene from tomatoes is one of the better foods high in antioxidants that gives tomatoes and other fruits and vegetables their red color. Lycopene health benefits include mopping up free-radicals that would reduce the risk of prostate cancer and other cancer of digestive tract. In January�s issue of the American Journal of Clinical Nutrition, (vol 79, no 1, 47-53) researchers from the Brigham and Women's Hospital and Harvard Medical School, Boston - USA provide the results showed that those women with the highest amounts of lycopene in their blood had half the risk of cardiovascular disease seen in those with low levels of the carotenoid.